The Vikings (2-0) have earned the honor of being our first BES No. 1 team of the 2016 regular season which, based on last season, bodes well for the defending NFC North champ’s odds of returning to the playoffs. That is, however, barring a string of further catastrophic injuries beyond those of quarterback Teddy Bridgewater (knee) and runningback Adrian Peterson (knee). Recent trade acquisition and Bridgewater replacement, Sam Bradford, looked stellar in the Vikings’ 17-14 victory over the Packers in Week 2. With Bradford, the Vikings may indeed have a legit passing attack that will take pressure off of backup runner Jerick McKinnon and complement their No. 8-ranked BES Defense. The Panthers (1-1) and Cardinals (1-1), last season’s NFC Championship combatants, round out the BES Top-10 at No. 9 and No. 10 respectfully. Both have clearly earned their positions after performing quite honorably against schedules that have so far ironically included last season’s AFC Championship teams in the Broncos (2-0) and the Patriots (2-0). 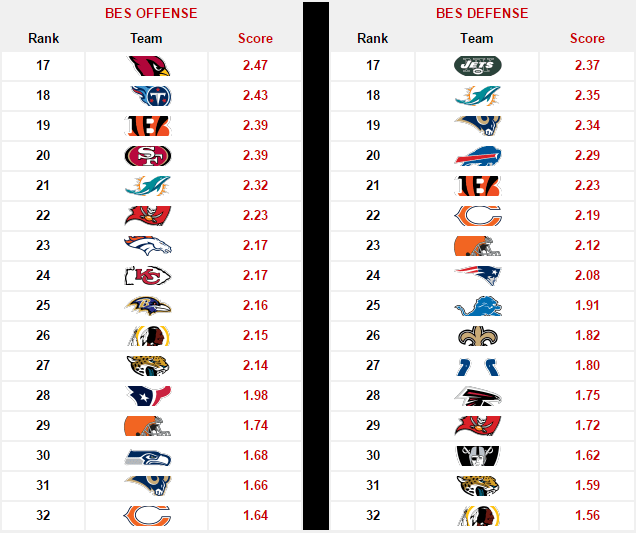 Both the Panthers and Cardinals feature the top two defenses in the BES, enough to fuel their continued ascent up the rankings. The Broncos come in at No. 7 overall and have started their 2016 season in similar fashion to last year – relying heavily on their stifling, No. 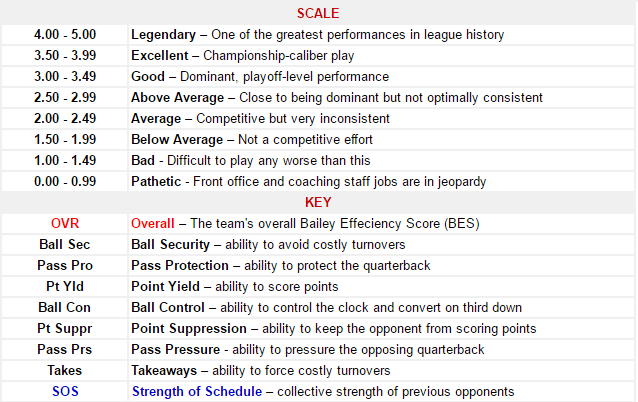 5-ranked BES defense to shoulder the burden of an offense struggling to find its way. 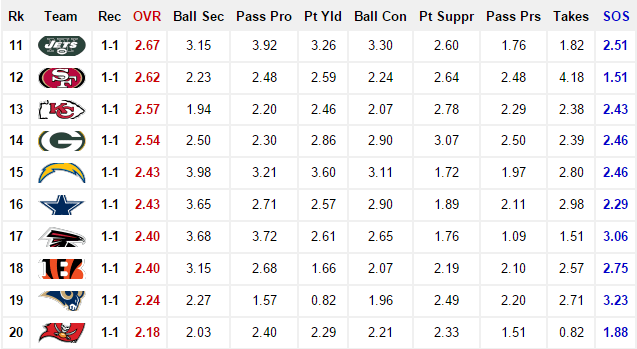 Quarterback Trevor Siemian, a former 2015 seventh-round draft selection, has been less than impressive with just one touchdown and three interceptions thrown in two games while guiding an offense ranked 23rd by the BES. At No. 6 in BES Overall, the Patriots may find their stay among the top-10 to be a tentative one as they will find themselves leaning on the arm of rookie signal caller Jacoby Brissett for the immediate future. Brissett, who takes over for an injured Jimmy Garoppolo (shoulder) and draws a tough opponent in the Texans (2-0) in Week 3. It’s uncertain whether star Patriots tight end Rob Gronkowski will make his 2016 debut against the Texans after nursing a nagging hamstring. The Texans boast the No. 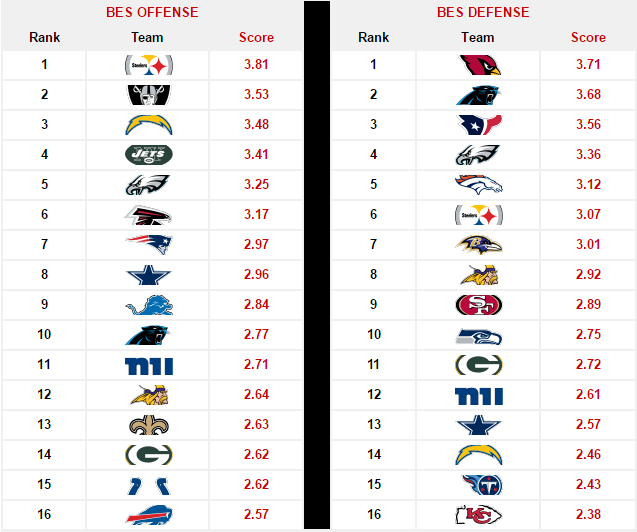 3 BES Defense with Pass Pressure and Takeaway scores above 3.70, numbers that could prove problematic for Brissett and the Patriots offense. Rookie quarterback Carson Wentz has guided the Eagles to an impressive 2-0 start and a firm third-place ranking in BES overall. 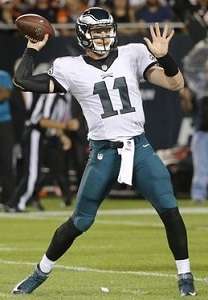 A second overall selection in the 2016 draft, Wentz has thus far compiled a healthy 94.1 passer rating completing 60.6% of his passes for three scores and zero interceptions. However, the Eagles, currently at No. 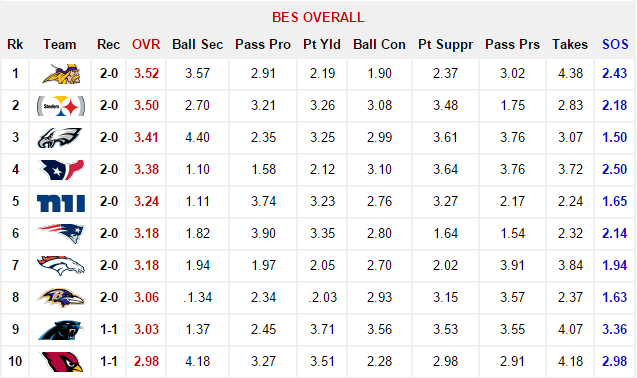 3 in BES Overall, have the weakest SOS (1.50) of the top-10 teams. In Week 3, they host the Steelers (2-0) who rank second in BES Overall and are a far cry from their previous two opponents in the Bears (0-2) and Browns (0-2) who rank 29th and 31st in the BES respectfully. Them Steelers is pretty high on the list! That’s what’s up! Yep. Revamped a lot of the math over the offseason to get more realistic results. No excuses if the Chiefs don’t win this game, they have the talent to do so, and the coaching. That shaky 3.90 Patriots O-line only allowed one sack/qb hit against a Texans front with a 3.76 Pass Pressure score thst features Watt, Clowney and Mercilus. Not bad although the Pats called a lot of bubble screensnand quick throws. Our Offense took a nose dive apparently with Petersen leaving for Philly has partially to do with our offense stalling. It’s amazing how Bradford was able to get adjusted so quickly. I feel with Bradford, McKinnon, Diggs, and our defense, Minnesota will do well this season. I also was observing Peterson before he got injured. The way he was stutter stepping in the back and not hitting the holes hard like he usually does, I feel he knew his knee was a 100%. Saying all of that, I hope Mn. stays high on the BES rankings! May be a bit easier if Marshall ends up being sidelined.. He’s a beast. 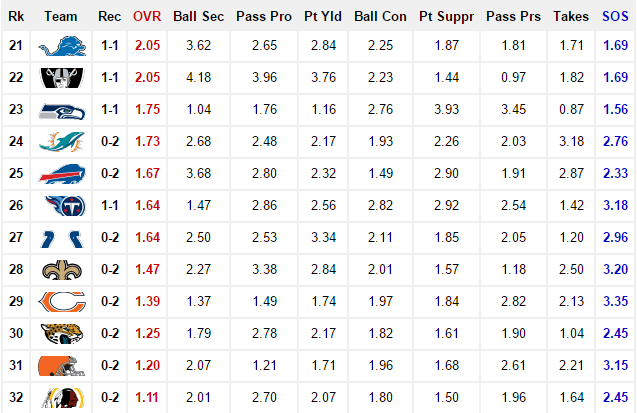 Average of all categories for NE is 2.48, for NYJ is 2.83 and for BUF is 2.57. Yet NE is ahead of the other 2 on your list; I’m curious why is it? It can’t be SOS because NE’s SOS is lower that the other 2. Is it the 2-0 vs. 1-1 vs 0-2 record? It wouldn’t make sense since your underlying assumption is that record is the product of scored in the categories. So how come the numbers don’t add up? The Overall score is not an average of the categorical scores though they are a part of it. The Overall score also takes into account other factors as well such as strength of schedule, margin of victory, win/loss record, win/oss at home or on the road, etc. So yes, the fact that the Patriots were 2-0 (now 3-0) definitely does contribute to them being ranked higher than the other AFC East teams.